The Linear Rotary Bearing is the first to offer unlimited linear and rotary anti-friction motion and at greater load life ratings than competing linear bearings. It is also interchangeable with existing linears. 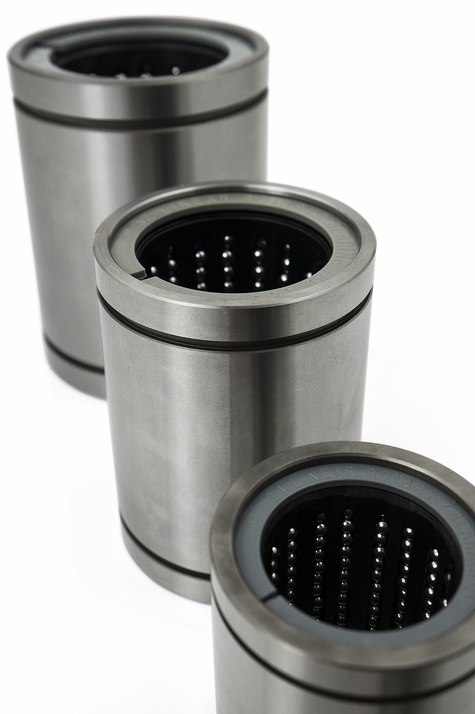 OUR Linear Rotary Bearing is the first to offer unlimited linear and rotary anti-friction motion and at greater load life ratings than competing linear bearings. It is also interchangeable with existing linears. The success of the bearing is due to the effective use of mathematics and geometry in its design. The ball track path is oval in shape (for infinite ball flow) and both sides of the straight portion of the path are utilized. 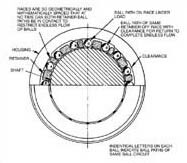 Two openings in the retainer on the same ball circuit (unlike other linear bearings having one opening) permit balls to contact the shaft and the inner race of the housing in either path, but not at the same time. For the balls to circulate, one path must be loaded and the other path must have clearance for the return of the balls. The races or inner surface of the housing are geometrically interrupted so that at no time can two paths of one track system be in contact. The clearance between the races permits the return flow of the balls. This ability of the retainers to rotate within the housings and the balls to rotate in any direction allows simultaneous linear and rotary motion. The longitudinal or reciprocal motion of the shaft causes the balls to circulate within their own track system. The rotational motion of the shaft causes the balls to flow much like a typical rotary bearing. In an application where only linear motion exists, the movement of the balls on and off the races creates a torque on the retainer. The torque is unbalanced, meaning that the retainer is free to rotate. This causes the retainer to creep or rotate slightly due to the linear motion of the shaft. This slight rotation offers the ball flow path, under load, exposure to new surfaces both on the race and on the shaft. This constant change of surfaces means longer bearing and shaft life. It is no longer necessary to orient the bearing during installation for optimum load carrying ability or, to break down an assembly periodically to rotate the bearing for increased life. In applications where rotation exist, it is obvious that the rotation causes the ball flow to utilize the entire width of each race and bearing surface of the entire shaft. In addition, this principle uses the maximum number of ball track systems and the largest ball diameters. Obviously, the more balls per circuit, the less unit load for each ball. The Linear Rotary Bearing features longer life at greater loads, smoother operation and the unique advantage of linear rotary anti-friction motion.